CTCSS – Do You Hear What I Hear? Hello everybody and welcome back to my blog! Today we are going to be talking about Radio Tones. There are two types of tones that you will deal with during your time as an Amateur Radio Operator. The first is Continuous Tone-Coded Squelch System(CTCSS) and Duel-Tone Multi-Frequency Signaling(DTMF). The second one is used more in your everyday life than you may realize, the first one is a radio thing. We are going to talk about CTCSS first, so to learn how and where you may use DTMF in your everyday life, please continue reading, we will discuss it next. So what is CTCSS? CTCSS is a circuit that is built into your radio to help reduce the annoyance of listening to other usersÂ on a shared two-way radio communications channel. CTCSS is an analog system that, when enabled, will keep your radio speaker closed unless the CTCSS code that you radio is set for is detected. This type system is used primarily in repeaters, although in some commercial applications, it is used on simplex as well. out of luck because you radio is turned off. Yea, yea, I know, most people have cell phones or land lines now and you could be contacted on there. What if you were camping and you didn’t have cell service? So when you go to bed, you could enable your CTCSS decode, if you radio has that function in it, on and you wouldn’t hear your friends continue to talk because they are not transmitting a tone with their transmissions. Later on, if something happened that they needed you for whatever reason, they could enable their CTCSS with the tone you have set and when they key up, your radio’s receiver would detect that the correct tone is being transmitted and open up your speaker so you could hear them. The only draw back to this would be, if you had your CTCSS enabled and no one else did, you wouldn’t be able to hear if anyone was talking. So if you went to call someone with your CTCSS turned on, they could hear you, if theirs was turned off, but you wouldn’t be able to hear them respond back to you. So how do you know if you have your CTCSS enabled? 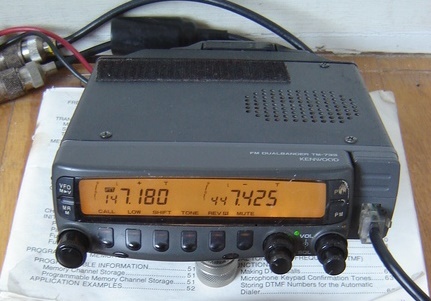 Here is an example of what a radio looks like when CTCSS is enabled. If you look above the 6 in 144.640 you will see a CT symbol. That means that it is enabled. On some radios that I have had in the past, like my mobile radio, it will have a T or a T-SQL. On some older radios you had the option of having just encode on and not decode. If you just saw the T there, then you radio was set to just send the code and keep your radio tone turned off. If it had the T-SQL then both the send and receive CTCSS was turned on. With newer radios there is a button, normally around the PTT button that is labeled MON. This is the Monitor button. What it does is open the receiver without the tone or the squelch of the radio. Not all radios have the CTCSS decode built into them though, however, most, if not all, have the CTCSS encode built in. I have seen a few in my amateur radio “career” that didn’t have the encode feature, however, that was on an older radio. Even though the average hand held or mobile unit might not have the decode function, all repeaters do. Whether, it is turned on or not is the main question. If areas where there are a lot of repeaters, or when there is a repeater on the same frequency that is in close enough proximity that you may get interference between the two, by enabling the CTCSS on the repeater, that’s problem will be eliminated. We have a couple repeaters where I live that have this issue on days where the 2m band is open. One of them is a repeater that my father owns. There is a repeater that is about 100 miles north of us and on good days, you can hear that repeater and sometimes even key it up. There is another repeater that is the main emergency communications repeater that is on the same frequency as a couple others in the area. Only one of them is close enough to be heard from where I live, unless it is a good day, then I can hear two of them. I believe that the repeater also sends a CTCSS tone, so if my HT or the radio in my car had CTCSS decode built into them, I could turn it on and only hear my local repeater. So what are the codes already? Below you will see a table with all of the CTCSS codes that are usedÂ in amateurÂ radio. The EIA code is a designator for that codeÂ according to Motorola. Here in theÂ US, any of these codes can be used. If you live elsewhere, like Europe for example, you will not use the 100.0 tone because it is a harmonic of the 50hz electricity that they have and can cause interference. There are other countries that also use 50hz electricity where that tone would not be used. Here in theÂ US we us 60hz. *NOTE: Check out this page for a more comprehensive list of tones. Now that we have talked about the list of tones, lets take a trip back a few posts and remember what we read about frequencies. Don’t remember? Here is the post I’m talking about, Frequencies and the Spectrum. Remember how a sound/radio wave looks like? The wavelength is the length of the wave in Time and frequency is how many full wavelengths there are in a second. With that being said the lower frequency codes will take longer to be processed by the receiving radio than a higher frequency code would. Even though the time difference may be only a tenth or hundredth of a second, when you put it all together using a repeater, it will makeÂ a noticeable difference. Picture this. You key up to talk on your HT. When you press the button, you transmitter has to encode the tone that you are using and transmit it. The repeater receiver then has to detect that there is a signal on the frequency that it is listening to and detect whether there is a CTCSS tone being transmitted as well. If it detects one it has to decode it and if it matches the tone that is set for its receiver, it in turn engages the transmitter and if the repeater also transmits a tone, has to encode it and then transmit it and whatever you are saying. All the radios that are within range of the repeater, detect that the repeater is transmitting and if they have CTCSS decode enabled, they detect the signal and have to process it and if it matches then it opens the speaker so that they can hear you talk. This all happens I a matter of seconds. If the code that is being used is 67.0 it can take noticeably longer to go through all that than if the code was set to 203.5. This is because of the wavelength of the tone. So the higher the frequency the faster the full wave will be received and processed. Sometimes these CTCSS codes are also called sub-audible tones. Even though they are within the audio range, most people will not be able to hear any of them. Some people, if they have good hearing, will be able to hear the higher frequency tones, however, radios have a built-in high pass filter that will normally filter out anything below 300hz. With that filter in place, your speaker wont even put out the tone to where you could hear it even if you can hear that low. You may have noticed a little further up in this post, that I said that CTCSS is an analog system. With technology racing ahead so fast, everything is going digital now-a-days. So the digital version of CTCSS is called Digital Code Squelch(DCS) or generally known as Continuous Digital-Coded Squelch System(CDCSS). It is known by several different names, depending on the radio manufacturer. For example, Motorola calls is Digital Private Line(DPL), while General Electric calls it Digital Channel Guard(DCG), and Icom calls it Digital Tone Code Squelch(DTCS). So many names for the same stinking thing, REALLY?!? It’s basically the same thing as what is going on with all the digital radios, D-Star, P.25, Yeasu Fusion something or other. Can’t we all just get along?! It reminds me of way back when computers were first coming out and each company had proprietary hardware! This post ended up being longer than I anticipated, so I think that I am going to break this post up into two posts and talk about DTMF codesÂ on Tuesday. I hope you enjoyed this posts and that you learned something from it. If you haven’t done so already, don’t forget to subscribe to my blog on email or by RSS feed, like me on Facebook and follow me on Twitter, Google+ and LinkedIn. Linked to all of these options can be found on the sidebar on the right. Thanks for stopping by and Ill talk to yall again on Sunday where we will be continuing in out Technician Class Series, covering Tech Frequencies.